Would you use a pair of scissors to cut your lawn? Maybe, if you weren’t aware of the invention of the lawnmower (Edwin Beard Budding circa 1830, in case you were wondering). In the world of hot water, the difference between a standard electric water heater and a hybrid electric heat pump water heater can be as noticeable as the one between a pair of scissors and a lawnmower. In fact, according to the Northwest Energy Efficiency Alliance (NEEA), a heat pump water heater typically uses just 30 percent of the energy of a standard electric tank water heater of comparable size. You can visit NEEA’s website (HotWaterSolutionsNW.org) to view an entertaining video illustrating this analogy. Once a homeowner becomes aware of the potential of heat pump water heaters, the conversation about how to implement the technology also tends to heat up quickly. NEEA research shows that consumers can save up to 60 percent in annual water heating bills, often totaling up to $450 per year per household. When you multiply those annual savings by the product life, it’s easy to see why these units are gaining popularity. Roughly 50 percent of all the homes in the United States have electric water heaters, which makes a hybrid electric heat pump a logical choice for dedicated green home builders interested in enhancing energy efficiency. Most units operate and install very similarly to a standard electric water heater, with a hot water, cold water and electric connections. Heat pump water heaters are so efficient because they use electricity to take heat from surrounding air and transfer it to the water rather than generating heat independently. They’re a good fit for single- family residential applications that have plenty of space for the installation, such as in a garage or a basement. It’s more difficult to get enough space in condominiums and apartments, making these installations rarer, but not impossible. The biggest advancement in heat pump water heater technology in recent years is improved energy efficiency. In addition, advancements in component technologies have also produced benefits for heat pump water heaters, the same way they have for air conditioners and other appliances. The space requirement is another key. When heat pump water heaters were first introduced to the market between 2009 and 2011, they generally required 1,000 cubic feet to operate. Today, a heat pump water heater only needs about 700 cubic feet. And, with A. O. Smith’s accessory duct kit, it’s easy to install a heat pump water heater in even small places by pulling in air from adjacent rooms. While some builders may think that heat pump water heaters are only viable in warmer climates, the reality is they have been extensively tested to work well in almost all regions and with most applications. Annual operating cost savings can be even greater for homeowners in colder climates on account of higher electricity rates. When installed indoors, these water heaters will operate efficiently down to 45 degrees Fahrenheit, making them practical for a garage or basement installation. In the Southern United States, natural factors such as warm, humid climates, spacious garages and the fact that it’s a big electric market are all factors that work in favor of a heat pump water heater. A Florida garage installation of a heat pump water heater runs just a fraction of the time each day (45 minutes to 90 minutes) compared with a garage installation in the Pacific Northwest, where one may run three to five hours. As the second largest energy consuming appliance in most households, many electric and gas utilities across the country offer significant incentives on ENERGY STAR® qualified water heaters, including up to $1,000 on heat pump water heaters. In many cases, the higher upfront costs of a heat pump water heater are paid back in as little as one year depending upon utility rebates and energy savings. In 15 states, the utility incentives on heat pump water heaters are instant, which means contractors can apply the utility discount at the point of purchase from their regular plumbing wholesaler. Another common practice is for utilities to provide the rebate directly to their customers. The U.S. Department of Energy notes that the lifespan of any water heater is largely a by-product of its installation, maintenance and operating conditions. It’s important to help homeowners understand the issues that can lead to premature failures, and that simple steps such as using a water pressure reduction valve, thermal expansion tank and correcting water imbalances are critical to the longevity of their water heater. As the Northwest Energy Efficiency Alliance video illustrates, homeowners would never cut their grass with a pair of scissors. Yet many are willing to heat their water in a way that’s just as inefficient. Thanks to recent engineering advances, the stage is set for surge in interest in heat pump water heaters. Homeowner savings have gotten too big to ignore. 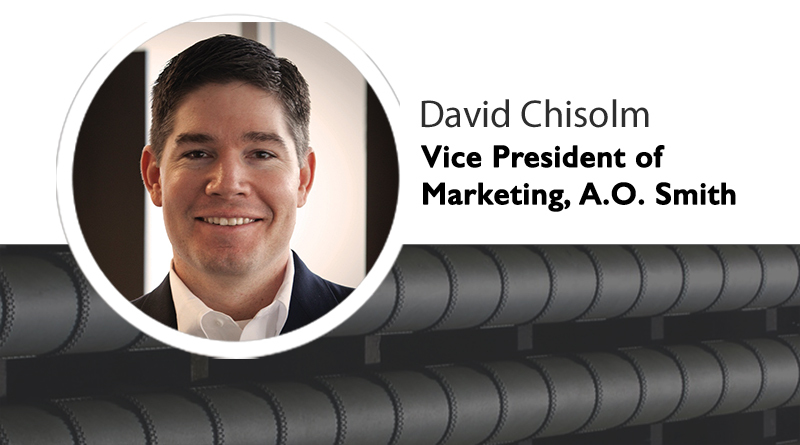 David Chisolm is vice president of marketing for A. O. Smith’s North American water heater business. Visit www.hotwater.com to access A.O. Smith’s local incentives tool and type in a zip code to find rebates.